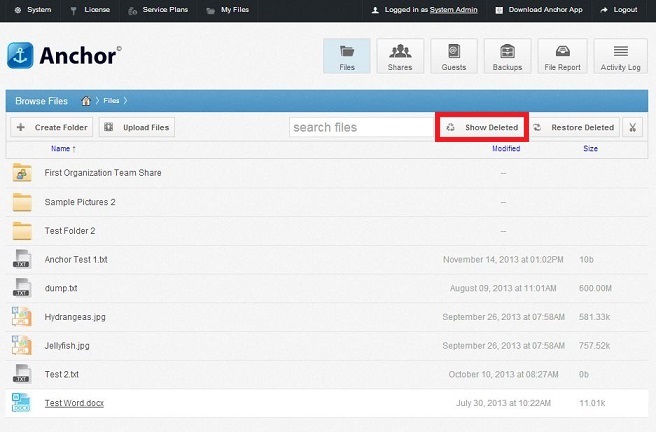 Depending on policy settings, end users can view and restore deleted files from within the web portal. The ability to view and restore deleted content is one of many data protection features available to end users. To learn about viewing and restoring older versions of files, please reference the How to View and Restore a Revision Knowledge Base article. To learn about the Revision Rollback feature, please reference the Rollback of Revisions Knowledge Base article. To learn about the Snapshot feature, please reference the Recover from Advanced Malware Attacks Using The Snapshot Feature Knowledgebase article. To learn how administrators can restore deleted content for end users, please reference the How Do Administrators Restore Deleted Files in the Web Portal Knowledge Base article. In the toolbar, click the Show Deleted button. Right-click an individual file and folder and select the Restore link. Alternatively, to restore all deleted files in the current folder, click the Restore Deleted button in the toolbar. The Restore Files dialog box displays, allowing you to restore all deleted files, or certain files deleted between a specified time frame.